Wurrungwuri, meaning ‘this side – this side of the water’ was named by the Cadigal (and project) elder Allen Madden. The waveform echoes the geological history of Farm Cove and is constructed of 250 sandstone blocks in a range of sizes weighing 350 tonnes in total. Blocks of wood and adobe, gaps within the sculpture, and the wave troughs, are intended to create habitats for plants, insects and birds. The quartz form, which contains a habitat for micro-bats, also speaks of the cultural history of this cove where Aboriginal people and the European convict colony first encountered one another. Woven within the 16,000 white quartz stones is an ochre coloured shield pattern recalling an Eora shield held in the Australian Museum, thought to have been traded in 1788 with the new 'boat people'. Its image has been used with the permission of Cadigal (and project) elder Allen Madden. 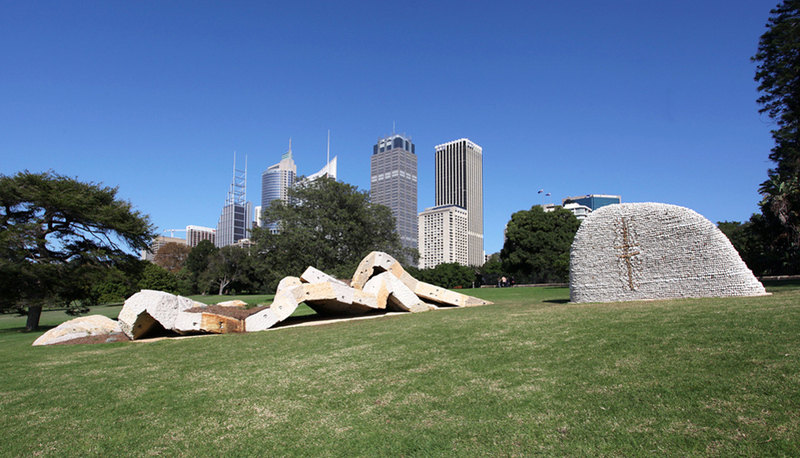 The sculpture was funded by the estate of Sydney finance executive and art lover Ronald Johnson. Arup were the engineers and Project Managers. The quartz stones are from Glenella Quarry. The sandstone blocks from Gosford Quarries were assembled by Traditional Stonemasonry.